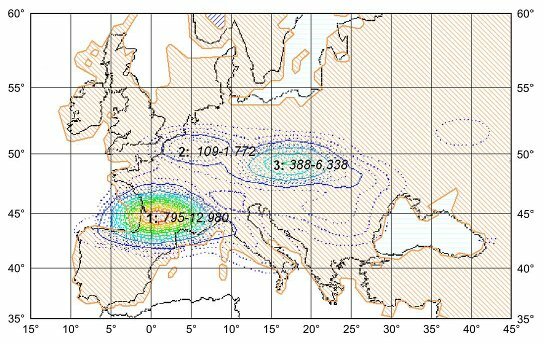 Paul Mellars and Jennifer C. French, Tenfold Population Increase in Western Europe at the Neandertal–to–Modern Human Transition. Science 2011. Pay per view. I got a copy and lots of complementary information and interesting debate (in Spanish) at Mundo Neandertal. 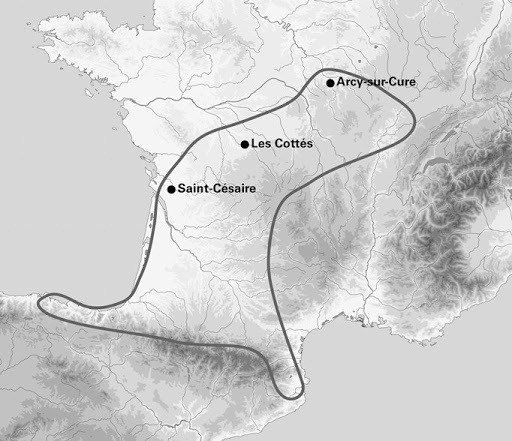 Mellars and French deal specifically with the transition between Chatelperronian and Aurignacian cultures in the context of the Franco-Cantabrian region. It is generally accepted that Chatelperronian was a Neanderthal culture and Aurignacian instead was mad by Homo sapiens, our species. The study estimates population sizes based on an archaeological record that is assumed to be quite complete (something only available for Europe probably). Jean-Pierre Bocquet-Appel et al. Estimates of Upper Palaeolithic meta-population size in Europe from archaeological data. Journal of Archaeological Sciences 2005. (PDF). Which was previously discussed by me here. Even though the demographic preeminence of the Franco-Cantabrian region in Upper Paleolithic Europe becomes more clear later, with the Last Glacial Maximum, already in the Aurignacian period (c. 41-28 Ka ago) it was the most populated area of Europe without doubt, holding surely 1/3 of all Europeans (later it becomes at least 2/3). This makes all of the estimates by Mellars & French 2011 more than quite relevant: what happened in the Franco-Cantabrian Region affected to most Europeans back then, Neanderthal, Sapiens or whatever else. 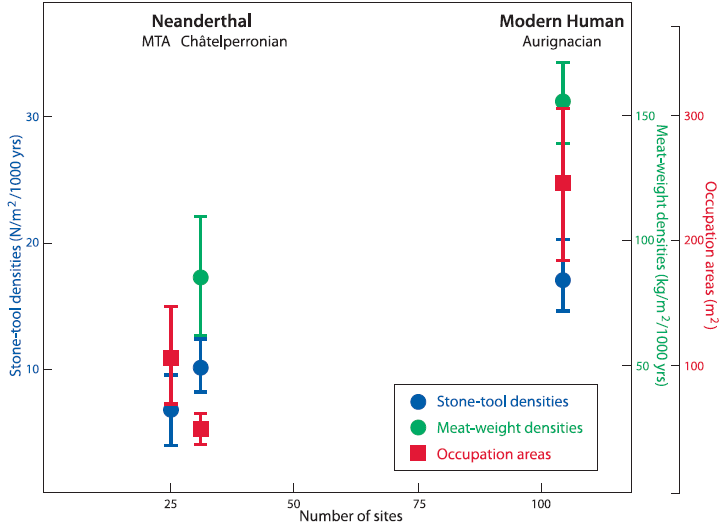 Bocquet-Appel found only minor differences in population density between Aurignacian and Solutrean, i.e. for most of the Upper Paleolithic generally accepted to have been made by Homo sapiens, only noticing a clear (and quite brutal) increase in population with the Late Upper Paleolithic, notably in Magdalenian contexts. Based on genetic estimates, I thought that there would be roughly the same number of Neanderthals as early Homo sapiens in Europe, that some 5000 people (1800-28,000) was the number that Europe could support in such technological conditions and that it did not matter if these were Neanderthals or Sapiens. But Mellars and French challenge this idea. 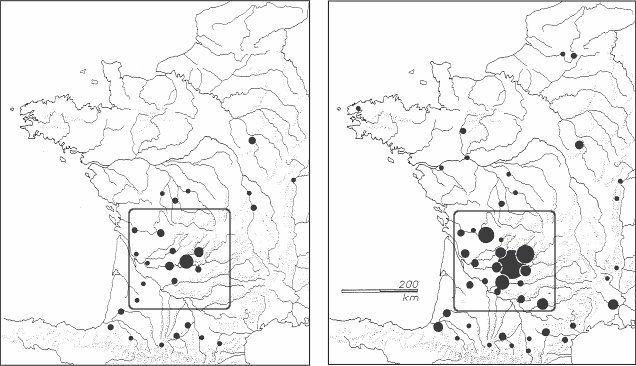 They compared the densities of Chatelperronian and Aurignacian sites in a rectangle centered in Perigord (the Paleolithic metropolis of Europe) and found that Aurignacian sites are more common than Chatelperronian, after adjusting for time, some 2.5 times. 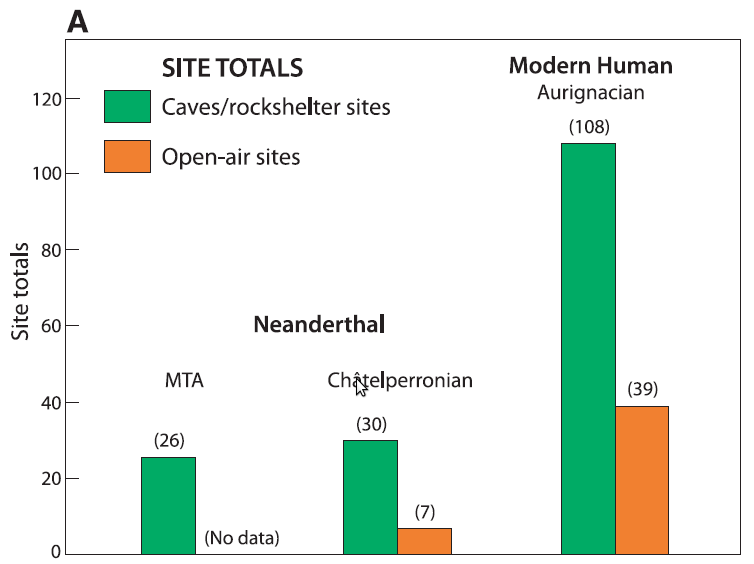 That means 2.5 more Sapiens settlements than Neanderthal ones. But more: they find that the density of use of the sites is also much greater for the Aurignacian ones, reaching a ratio of 9 to 1. Assuming that the average figure proposed by Bocquet-Appel for the Aurignacian population of Europe (4424) would be correct, then there would be only 491 Neanderthals in all the continent. I do not think this is a credible figure. Let’s assume then that the correct figure of BA is the maximum (he may well have been too conservative in his estimates, I guess): 28,359 people. This implies 3151 Neanderthals. It is a more credible figure but still a bit too low. Of course there may be an error here and it is another different way of estimating populations, not directly comparable and much more uncertain than estimates based on factual archaeological data. Still, I have the strong impression that the archaeology-based estimates are too low, that the actual populations are being underestimated. 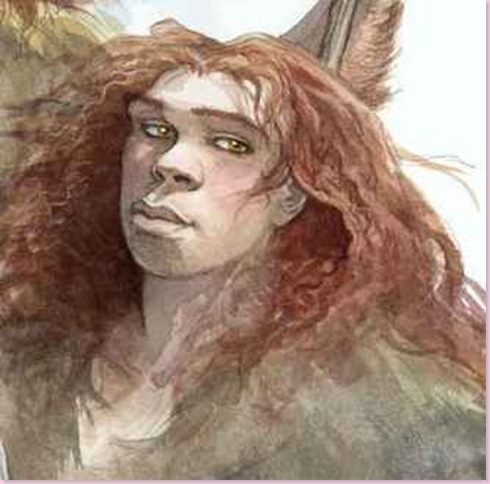 For example, if the lowest genetic estimates would be correct, then European Neanderthals would be c. 5000. Following Mellars & French, the earliest (Aurignacian) Sapiens population could be then 45,000 (almost double than the maximum figure estimated by Bocquet-Appel), what in turn would make the Late Upper Paleolithic (Magdalenian and Epigravettian) population of Europe (6.5 times that of Aurignacian) roughly of 292,500 people (200,000 or so in the Franco-Cantabrian region). It could well be double too. Half a million hunter-gatherers roaming Europe upon the arrival of the first farmers? Does this make any sense? I’m not sure but it’s not totally impossible, specially if we consider that sea resources (seals, fish, mollusks and crustaceans, whales maybe) had become very important by then. Of course, fine tuning of the figures available may also be recommended. Anyone? A very interesting observation is made by Joy in the comments section: the Aleut people, whose technology and way of life can well be compared with that of Late UP or Epipaleolithic Europeans, numbered 25,000 people upon contact with modern Europeans (now they are only 15,000 however). This is a quite sizable population for a relatively small and cold territory. I have calculated that the traditional Aleut territory has some 30,000 km², what is just 5.3% of the territory of modern France (552,000 km², excluding overseas dependencies) and just 0.3% of all Europe. Extrapolating only to “France”, we’d get some 500,000 people. Sure that “France” is not all coast, as the Aleut territory was but it’s neither so far North and cold (the Aleut lands’ climate and geography is more comparable to Norway in fact). In any case, what I find with this comparison is that the figures mentioned above of 300,000 or more people in late UP Europe are perfectly plausible, even maybe a bit shy and low. At 18 months, Neanderthal children already had big teeth, larger than those of modern humans. The new finding of a lower jaw, at a Belgian cave, by Isabelle Crevecoeur, belongs to the youngest Neanderthal specimen ever found and already possessed Neanderthal traits, such as a strong jaw and big teeth. While the kid had thinner enamel than would be found in modern humans of similar age, it already shows a clear early growth spurt in comparison to our species, starting this development maybe as early as 12 months old. The research is scheduled to appear in the Journal of Human Evolution and has already the blessings of famous Neanderthalist Erik Trinkaus, who thinks that the conclusions are well-reasoned and reasonable. Sources: Discovery News (via AiE), Yahoo News. Were the ornaments of Grotte du Renne made by Neanderthals? According to Randall White the layers are so mixed and convoluted that it is impossible to say. However João Zilhão argues that White’s evidence says exactly the opposite. Zilhão has in the past also clashed with other researchers on stratigraphic issues related to Chatelperronian, Neanderthals and the MP-UP transition in SW Europe. Critically the earliest research of this cave, by Leroi-Gourham, found many Neanderthal teeth in the Chatelperronian layer, that is arguably intermediate between Mousterian and Aurignacian. However recently there has been some questioning of the attribution to Neanderthals of the Chatelperronian industry. The case is that dates obtained from Chatelperronian materials range from 49,000 to c. 21,000 years ago, when Neanderthals are already thought to have been completely extinct for some 10 millennia (longer locally). If this interpretation of White is correct and Chatelperronian effectively happens to be an industry of Homo sapiens, then it would be a lot easier, specially with such late dates as 21,000 BP, to trace the origins of Gravettian industry, whose closest relative is no doubt Chatelperronian (both were originally described as Perigordian and only lack of direct evidence for continuity broke down that category in two eventually). Zilhão’s counter-argumentation seems to go along the lines of most dates at Grotte du Renne being consistent with known Neanderthal presence (i.e. in the oldest range). I would say that, if the oldest date is just 49,000 BP, this fits completely well in the model that argues that all UP technologies in Europe, including Chatelperronian possibly, are the work of our species, because these technologies only appear since c. 49-48,000 calBP and more strongly since c. 44,000 calBP. Ref. 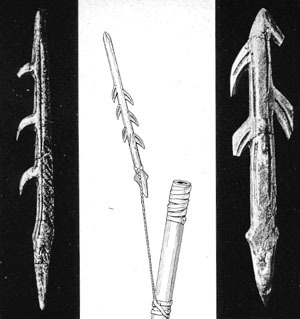 Thomas Higham et al., Chronology of the Grotte du Renne (France) and implications for the context of ornaments and human remains within the Châtelperronian. PNAS 2010 (pay per view, varying on location and time of retrieval).